Please do not name streets after food; it is misleading and leaves me hungry and grumpy. The street I am talking about is Cha Ca Street in Hanoi, Vietnam. A street named after Cha Ca a favourite Hanoian fish dish. A dish so delicious they named a street after it… and where is the best place to find this delicious dish? At Cha Ca street of course.. So this was the first stop on our visit to Hanoi with Cha Ca high on the ‘to eat’ list at a handy location in the Hanoi Old Quarter. The holiday starts with a kick in the groin. While this dish does look delicious the taste not so much. On the tastiness scale it would maybe come in at a 5. Mediocre. A UK equivalent? Maybe Toast Street, Spam Street or Veg Soup Street. Food which would make a nice addition to a hotel buffet and no more. But it does look good… Below is what we are served and Fanfan’s face says it all. Far from impressed. A meal for two costing roughly 340,000 Dong ($16US). The turmeric spiced Cha Ca fish we find bland, the sauce it is cooked in no more than oil. The only way to find flavour is with added branches of coriander and reluctant splashes of fish sauce. Maybe we are spoiled in Thailand but I honestly found it hard to taste this fish dish. We should have walked away… Arriving to the corner of Cha Ca Street we were quickly flagged down by a Cha Ca tout under neon lights. Waving arms as if to sell a cheap suit. Why we kept walking I have no idea. 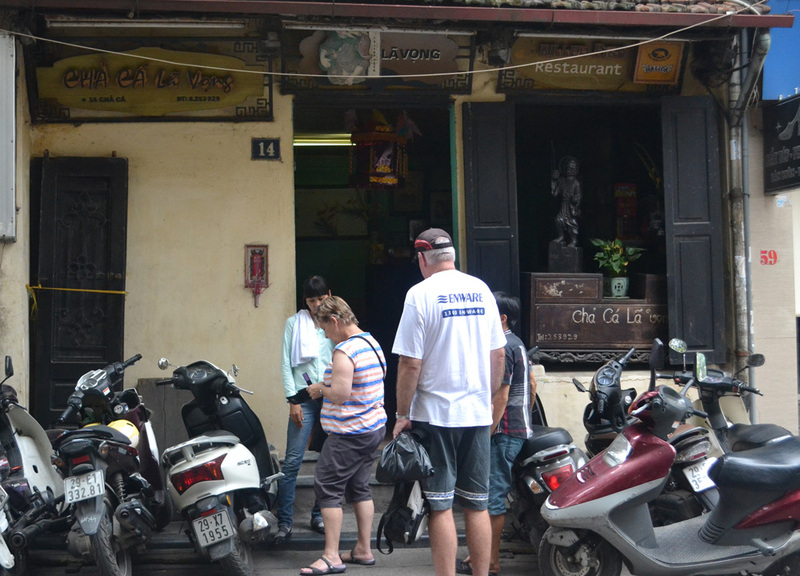 Instead we opt for a more amiable establishment further into Cha Ca Street following what looked to be a steady flow of local eaters. It wasn’t until sitting down we realise our stereotyping eyes had duped us. The restaurant was in fact full of Asian tourists and of course a dabble of fellow farangi. 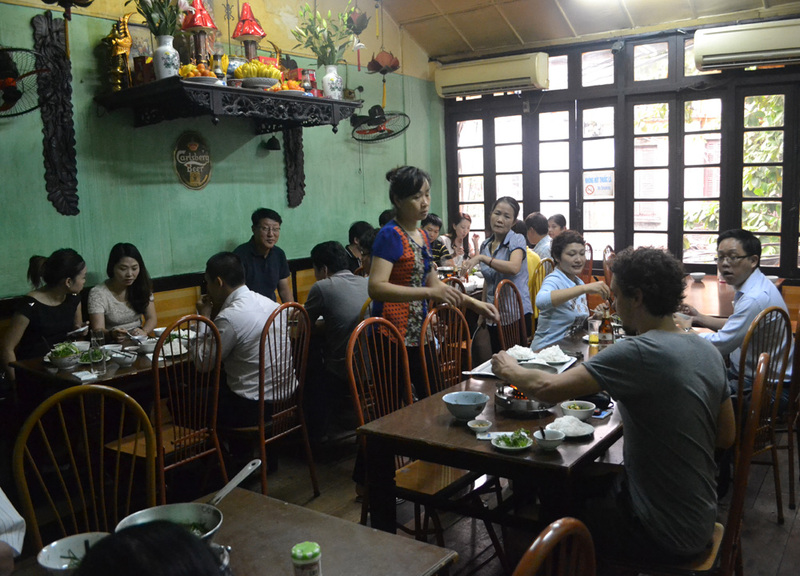 Turns out this place was a tourist trap and we were paying a premium to eat in the ‘The Oldest Restaurant of Vietnam’. Not certain how true this statement is but I know it wasn’t our reason for being there. 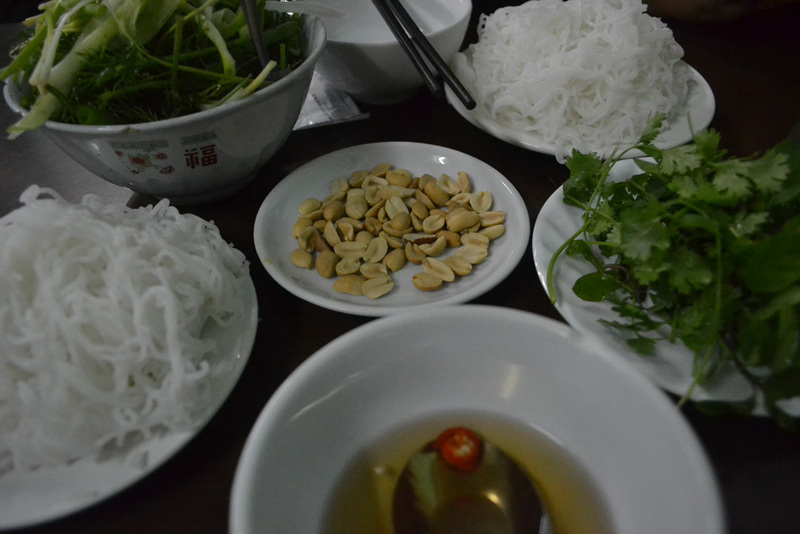 Cha Ca street seems to be more about the experience, history and authenticity of this famed ‘Vietnamese Special Dish’. An experience which failed to satisfy my growling stomach. No more Cha Ca arrived to the table. No matter how long we wait staring blankly at one another, “Maybe it’s a buffet?.. There’s definitely more to come”. The bill arrives to the table for 340,000 Dong ($16). While $16 may not appear overly expensive; let me put it into perspective. At the nearby Bia Hoi street we could have bought 68 glasses of beer (5,000 Dong). At the Banh Mi stall a few doors down on Cha Ca Street we could have bought 22 meat filled baguettes. In fact being so hungry on leaving we bought a baguette and three cakes. On the walk back to our hotel we reminisce of delicious fish dishes from around Southeast Asia “remember the Chu Chee Pla in Isaan…. 5 dollars. A third the price but twice the size”. I am rarely disappointed when it comes to eating in Southeast Asia and fact is this is likely the first. Though I think they ripped you off – cha ca sells for around 120.000 dong per generous serving in most places… That said, you can’t compare prices for food in one of thailands poorest areas with prices in the capital of vietnam (on average, I find food cheaper in hanoi than in Bangkok).